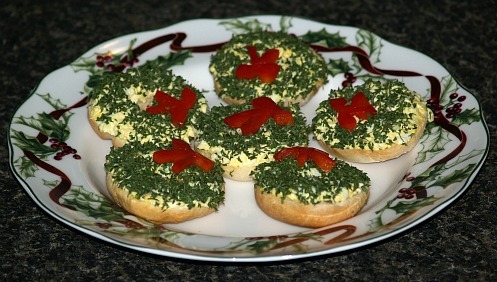 Learning how to make holiday appetizer recipes is very popular from Thanksgiving through New Year’s Eve. For these special occasions we want to serve very special appetizers. Not only do we want them to taste good but we want them to be extra special in their presentation. A good host or hostess will pay close attention to learning how to make holiday appetizer recipes and how they are to be served. If they are preceding a large meal this should be taken into consideration. You will want these recipes to compliment the meal which is to follow. All should be served in small helpings so as not to sate the appetite but rather to stimulate the appetite. 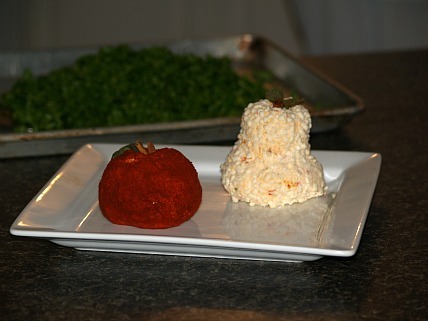 Learning how to make holiday appetizer recipes includes making a special presentation for that holiday. This special presentation works well to adding the holiday spirit as well as inviting your guests to taste. If your planned menu is of heavy meats and sauces then your appetizers should be small and light. This main holiday time is when many parties are held when the entire table may be covered with only appetizers. For these special occasions your choices are endless; you may choose platters of complicated assortments of meats, heavy rich cheese recipes, vegetables and even sweet appetizers. For these occasions, a variety of flavors and textures should be offered; this means including meats, starches, vegetables and fruits. Give special attention to your guest list and offer holiday appetizer recipe for everyone; just because you do not eat meat does not mean your guests do not. A good host or hostess strives to please all guests. Follow up by garnishing each recipe with some special decoration for the occasion; it does not have to be large or elaborate but just a “touch”. These look very festive for Holiday appetizer recipes. Mix cheeses and Worcestershire sauce in bowl; cover and refrigerate 8 hours. Divide dough in half and shape into balls; roll balls in paprika completely coating. Make indentation on top and insert small piece of cinnamon stick for stem; add herb leaf for apple leaf. Can also be shaped in pear shape; roll in Parmesan cheese and add stem. Add the above cornucopia to your holiday appetizer recipes by purchasing frozen puff pastry or with the following pastry recipe. Combine and mix flour and salt; cut in the shortening. Beat 2 EGGS with ¼ CUP cold water; add to flour mixture. Mix with fork until flour is moistened. Stir in 1 to 2 TABLESPOONS of water if needed. Gather dough together into a ball; divided into 4 parts. Cover each part with plastic wrap until ready to use. TO SHAPE CORNUCOPIA loosely crumble foil squares into balls. NOTE: Cut 10 to 12 square pieces of foil (12 inch squares). Stack the balls in center of 20 inch sheet of foil. Bring ends up wrapping tightly shaping a cornucopia. NOTE: Cornucopia should be 10 inches long with opening of 5 inches. Spray mold generously with nonstick cooking spray. FOR DOUGH roll on floured surface. Roll PART 1 of dough into triangle about 1 inch larger than base of foil mold. Transfer dough triangle to ungreased baking sheet; place mold on pastry. Roll PART 2 of dough to oval (15X10 inches); cut lengthwise into 1 inch strips. NOTE: A scalloped pastry cutter makes it nice. Mix 1 EGG with 2 TEASPOONS water; brush onto 1 short strip. Place strip (Egg mixture out) around tip of mold making a point. Starting with shorter strips (One at a time) brush 1 side with egg mixture. Carefully drape strips over mold overlapping each strip ¼ inch. NOTE: Let extra pastry on ends to lie on the base UNTIL LATER. Roll PART 3 of pastry to oval (15X10 inches); cut into 1 inch strips. Starting with longer strips continue covering the mold. NOTE: Press dough strips gently securing without any gaps. Do not cover opening with pastry dough. Divide PART 4 into 3 parts. Divide 1 PART in half; roll HALF 1 into a rope about 24 inches long about ¼ inch thick. Flatten rope with rolling pin making a strip about ½ inch wide. Cut strip in half lengthwise; twist both halves together gently and loosely. Brush the outer edge of the opening of the cornucopia with egg mixture. Place the twisted rope around opening pinch ends to secure. Using HALF 2 of pastry shape another twisted rope as before. Brush egg mixture around base of cornucopia over overhanging strips. Place twisted rope around base pinching ends to secure. Trim EXCESS PASTRY showing under the twisted rope. Brush base rope with egg mixture. Use remaining pastry to shape vines, fruit, leaves, etc. for decorating cornucopia. 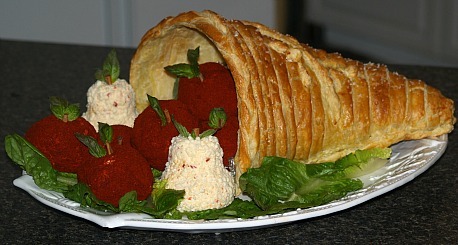 NOTE: use egg mixture to adhere decorations to the cornucopia. Brush entire cornucopia with egg mixture. Bake 10 minutes until set; REMOVE from oven. REDUCE HEAT TO 350F degrees. Brush cornucopia with milk; sprinkle generously with sugar. NOTE: If excessive browning is occurring cover areas (Like tip and edge) with foil. Cool on tray 5 minutes, loosen with large spatula and move to a rack. Cool completely at least 1 hour; carefully remove foil from cornucopia. These holiday appetizer recipes are always the party favorites. Mix olives, oil, orange peel, juice and marmalade; cover and refrigerate for 3 to 4 hours. Press topiary base securely in flowerpot; glue if necessary. Fill pot 2/3 full with rocks; insert toothpicks into topiary cone and place olive on each toothpick. NOTE: Cover entire cone with olives on toothpicks. Line top of pot (over rocks) with tissue paper; cover paper with peanuts. Combine in mixing bowl the cheese food spread, cream cheese, onion and garlic powder. Beat mixture until smooth; spread on min bagel halves. Garnish with chopped parsley and a pepper bow; refrigerate until serving. Melt cheese cubes in small saucepan over low heat; stir until smooth. Pour into bowl and keep warm. Arrange vegetables on plate as desired. 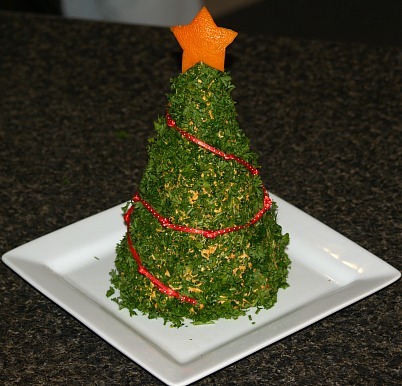 EXAMPLE: Arrange broccoli pieces to shape Christmas tree; fill in with remaining vegetables. Serve with nacho cheese sauce. Preheat oven to 375F degrees; grease rack on broiler pan. Cut riblets between bones into serving pieces; place meaty side up on broiler rack in single layer. Cover with foil and bake 50 minutes. Combine and mix remaining ingredients; brush ribs with half of the sauce. Bake uncovered 10 to 20 minutes longer or until pork is tender. Heat remaining cranberry mixture to boiling in saucepan; serve with pork. Mix chicken livers, water, bouillon, onion and thyme in saucepan. Heat to boiling, reduce heat and simmer until livers are done about 15 minutes; cool. Drain reserving ¼ cup broth. Mix chicken livers, reserved broth and remaining ingredients in a small bowl. Beat on low speed and then on high until creamy and smooth. Place mixture in serving dish; cover and refrigerate at least 3 hours. Place mushrooms in shallow glass dish. Shake remaining ingredients except parsley in a tightly covered glass jar; pour over mushrooms. Cover and refrigerate at least 2 hours; drain before serving; sprinkle with parsley. 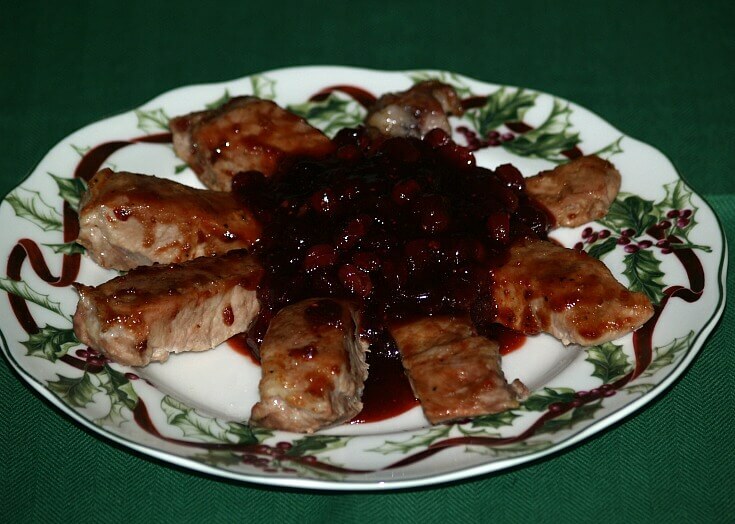 This makes a great presentation as holiday appetizer recipes and delicious too! Combine all ingredients except fresh parsley; mix thoroughly. Shape mixture into cone shape Christmas tree; if too soft, refrigerate first. Roll tree into fresh chopped parsley; press firmly to make parsley stick..